PHNOM PENH, Sep 13 2012 (IPS) - Public health experts in Cambodia are unenthused by reports of trials for a dengue vaccine conducted in neighbouring Thailand, saying it will be too costly for those who need it most – children in the least developed and developing countries. “Of course, they cannot come out with a vaccine that costs 20 cents,” Dr. Philip Buchy, head of the virology unit at the Pasteur Institute of Cambodia, told IPS. Buchy was referring to the Paris-based pharmaceutical company Sanofi SA’s dengue vaccine efficacy trials, the results of which were published in the British medical journal Lancet, this month. Dr. Stephen Bjorges, leader of the vector-borne disease team at the World Health Organisation (WHO) in Cambodia, agrees. Even if Sanofi succeeds “funds would need to be mobilised” to cover the cost of inoculating children in Cambodia, he said. 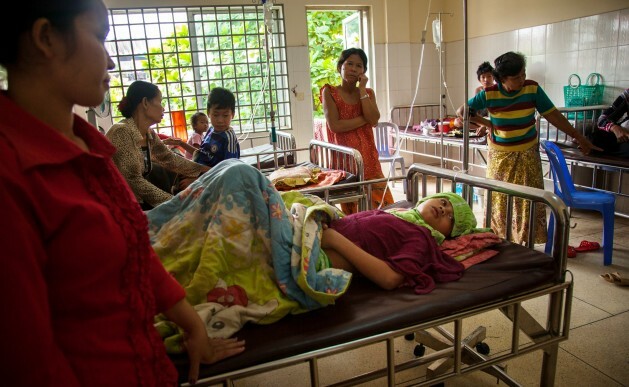 A dengue epidemic that raged through Cambodia during the first eight months of the year landed more than 30,000 people in hospital, the majority of them children. According to the Lancet report, Sanofi’s vaccine offers some protection against three of the four serotypes of the dengue virus – about 30 percent against serotype one and from 80 to 90 percent against serotypes three and four. However, Sanofi’s vaccine does not protect against serotype two, which was circulating in the study area during the trial, giving the vaccine an overall efficacy rate of 30.2 percent, the report said. Large-scale phase-3 trials are underway on 31,000 children and adolescents in Latin America and Southeast Asia, Sanofi said in a press statement timed with the release of the Lancet report. According to the Reuters news agency, the company has already invested more than 430 million dollars in a new factory in France to produce the vaccine. WHO’s Bjorges said that if the phase 3 trials proved the vaccine was effective, its initial market likley would be tourists from wealthy nations and the military, a view Buchy agrees with. Still, both doctors expect increasing investment in vaccines and vaccine-related research as global warming expands the range of the mosquito that transmits dengue into southern Europe and the United States. “Interest in vaccines is going to grow exponentially now that there is some success with a vaccine,” Bjorges said. The European Union provided more than 10 million dollars for three dengue-related research projects in Southeast Asia earlier this year, including one in Cambodia to investigate the role that asymptomatic carriers play in transmission, Buchy said. “If we can identify a gene that is protective this may allow us to develop drugs for treatment and vaccination,” he added. Funding for prevention and control of epidemics in poor countries remains scant, however. The budget for Cambodia’s national dengue control programme is about 500,000 dollars, most of it provided by the Asian Development Bank. Breeding sites have to be eradicated weekly in order to prevent the mosquito that transmits the virus from emerging from its larvae, and this requires changes in human behaviour that have proven difficult to sustain on a weekly basis, Bjorges explained. Another problem may be that those who allocate global health funds rely on short-term cost-benefit models, Bjorges said. They are under pressure to produce quick, quantifiable results for the funds they allocate, and dengue prevention and control projects do not fit these models, he explained. New research, however, suggests that dengue is far more prevalent in Cambodia than previously calculated, underscoring the need for increased investment in prevention. The disease is underreported partly because Cambodia’s dengue surveillance system relies on data from state-run hospitals and charitable children’s hospitals. Cases treated at private hospitals and clinics are not reported to the health ministry. Charitable hospitals treating dengue patients in Cambodia have been pleading for donations after being inundated with patients in May. The National Paediatric Hospital has been relying on nursing students to treat children who spill into the hallways and the foyer around the main stairwell. The hospital receives a mere 20 dollars per patient, regardless of how long the child stays, Moniboth said. On average, doctors receive monthly salaries of about 125 dollars, while nurses are paid about 75 dollars, he said. With such meager funding for healthcare what is needed is a cheap vaccine, Moniboth said. The Dengue Vaccine Initiative is funded by the Bill & Melinda Gates Foundation and is concerned with accelerating the introduction of dengue vaccines into developing countries. We have had extensive discussions with sanofi pasteur concerning the introduction of their vaccine once it has proven to be safe and effective. Sanofi pasteur has committed to introducing the vaccine into developing country public health programs first. Markets such as tourists will be targeted later. The price of the vaccine is not known since it is still under development. Nevertheless, sanofi pasteur has committed to tiered pricing in which price will be based on the ability to pay. Also, GAVI has decided to look at dengue vaccines. If GAVI should decide to include dengue vaccines in its programs, poor countries like Cambodia could be eligible to buy the vaccine with a small co-payment that would be much less than $1.00. We are optimistic that if the vaccine proves to be safe and effective, it will be accessible by people in developing countries. This is a helpful and reasonable response, especially citing the foundations and organizations involved in funding. I do wonder, however, about some of the Board members of GAVI with ties to major global investment banks, and if they are simply dribbling pocket-change to these efforts while putting much larger investments into the industries which have contributed to the structural violence endured by the vulnerable. It’s not as though any of these tragedies and deaths are occurring in a vacuum, bounded by geo-political borders.